All students at Sacajawea Middle School must put their phones in a cell phone holder when they walk into class. 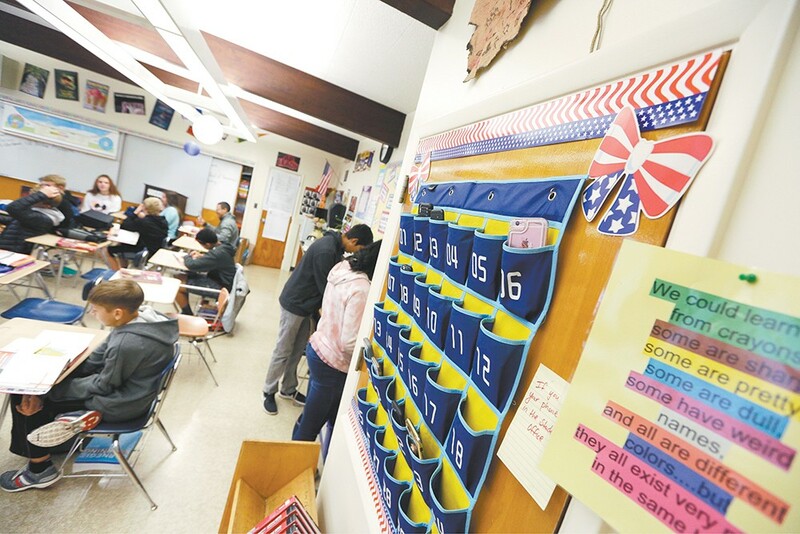 In an eighth-grade Sacajawea Middle School classroom, a student reads out loud from a textbook. His classmates take notes with pencil and paper. Teacher Cindy Schwartzenberger hands out worksheets the kids put in their binder. Notably missing from their desks? Cell phones. "They're totally engaged," Schwartzenberger says of her students. That can be rare for a generation of kids who have often had cell phones put in their hands before they turn 10 years old. Kids are increasingly becoming addicted to social media and their phones, and it's a reality that many schools are just now taking measures to combat. For Schwartzenberger, cell phones used to be a constant struggle. Students weren't allowed to use phones in class, but it was impossible to enforce when phones would buzz in their pockets with a new text or Snapchat notification. So Schwartzenberger got a cell phone holder that hangs from the wall and has 30 pockets. When students walk in, they are to put their phones there until class is over. It was such a success that the entire school adopted the policy. The Sacajawea parent-teacher group bought cell phone holders for all the teachers. As a result, teachers are having fewer problems in class, and fewer students are disciplined by administrators for using phones. "I think a lot of schools across the country maybe are afraid to get into a struggle with taking a cell phone, but we're not really taking it. We're just saying this is where phones go during class time," Schwartzenberger says. "I think every school in the country should do it." Eighth-grade teacher Cindy Schwartzenberger says all schools should ban phones during class time. Sacajawea, of course, isn't the first school to ban phones during instructional time. In February, Coeur d'Alene Public Schools banned cell phones districtwide during instructional time. "Psychologists are now telling us that just having it in the pocket is a distraction," said Board of Trustees member Dave Eubanks, according to the Coeur d'Alene Press. The rule means students' phones must be turned off and "off the person," meaning in a backpack or locker. Since then, says district spokesman Scott Maben, principals and teachers have appreciated the uniform policy. "It makes it much easier for the teachers to deal with violations," Maben says. In France, the entire country banned cell phones during school. Starting this year, kids ages 3-15 cannot use smartphones on school grounds, with few exceptions. Spokane Public Schools doesn't ban phones in all schools. Instead, certain classrooms or schools make their own policies regarding cell phones in classrooms. Steve Fisk, North Central High School principal, says the math department has experimented with no cell phones in class. 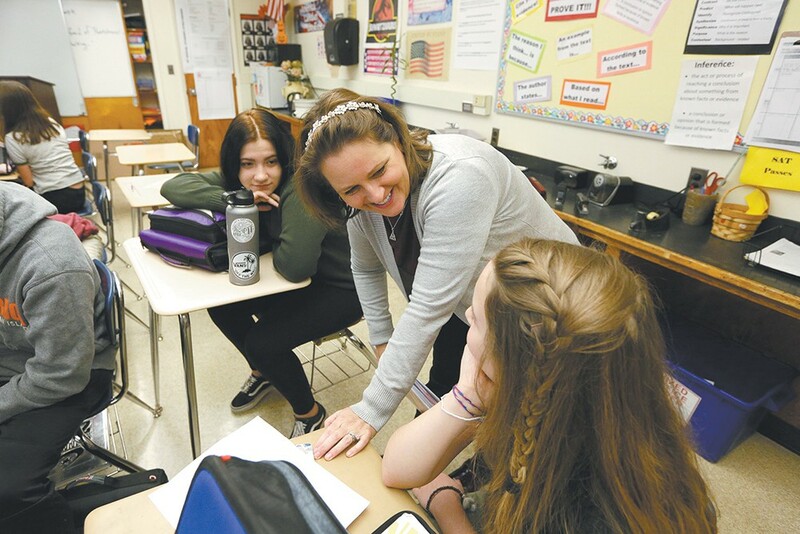 At Lewis & Clark High School, all classrooms are "no phone zones," says principal Marybeth Smith. But some classrooms have students turn their phones in before class and some let them have it in their pocket. If there's an issue, students put the phone in a brown bag and then talk to the teacher after class. "I thought we'd have a ton of pushback, and frankly, the kids went, 'alright,'" Smith told the school board last month. "I had a kiddo today say, 'You know what, it's so nice not to have my phone with me.'" What persuaded principal Jeremy Ochse at Sacajawea to develop its "no phone" policy is the negative effect that they have not just on the classroom, but on kids overall. He says administrators, teachers and staff are thankful for the amount of time that's been saved dealing with disciplinary issues with phones. "It just made sense for our school," Ochse says. "It was a good fit." Roughly four in five teens have a smartphone, according to a market research firm called eMarketer. A 2016 survey from Common Sense Media found that half of teens feel "addicted" to their phones, with three-quarters feeling the need to immediately respond to texts, social networking messages or other notifications. One study published in the journal Computers in Human Behavior found that students who use Facebook while studying had lower grade point averages. Jens Larson, vice president for enrollment management at Eastern Washington University, studies social media and its influence on education. He regularly speaks to kids in Spokane schools on how to smartly use social media. He says, in general, cell phone holders for students to put their phones in during class are smart. That's especially true if schools can provide the internet with other district-controlled devices like laptops for kids to use during class that filter out social media sites. "It's wise for schools to clamp down on social media use in schools," he says. 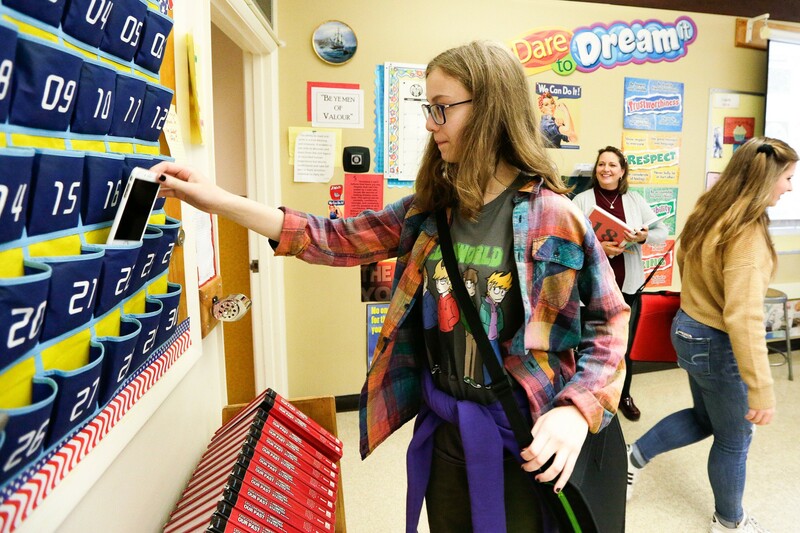 13-year-old Emelia Sanburn picks up her cell phone from a holder after class. From a purely academic angle, cell phones serve as a distraction that makes it difficult to focus during class. And social media can affect the reading ability of teens. "You see it a lot with the way students read longform texts," Larson says. "They may not concentrate on long texts, but more perniciously, there's an inability to connect arguments within long texts." Some parents want students to keep phones during class, just in case there's an emergency and they need to contact the child. But as Larson notes, emergencies that require a parent or guardian to text a student during class are extremely rare. Meanwhile, the academic advantages are clear. A study published by the Centre for Economic Performance at the London School of Economics found that banning phones from school premises improved student test scores by 6.4 percent. And it adds instructional time for teachers — the equivalent of five days to the school year. And then there's the benefit of students not compulsively checking their social media accounts at all hours of the day. A recent study, also in the journal Computers in Human Behavior, linked the use of social media to depression and anxiety among young adults. That can be hard to overcome. When schools ban students from checking their phones, they may push harder to use them at home, creating a challenge for parents. "Social media has become a location," says Spokane Public Schools Chief Academic Officer Adam Swinyard. "Just like the cafeteria, just like the locker room, just like the hallway." Not being on social media, for them, is just like not sitting at the lunch table with all their friends. If they miss out on socializing, then they might be the only kid standing there with no idea what anyone's talking about. "I think that's some of the challenge," Swinyard says. Spokane Public Schools is in the process of considering district-wide policies regarding cell phones and social media. Those policies may address how to educate students on related issues such as online bullying, abuse and threats. But if you ask teachers like Schwartzenberger, banning cell phones in class is a leap the district should make. The original print version of this article was headlined "Out of Network"